Bodhidharma (Sanskrit: बोधिधर्मChinese 菩提達摩, pinyin Pútídámó or simply Dámó; Wade-Giles Tamo; Japanese ダルマ, Daruma, Vietnamese: Bồ-đề-đạt-ma), also known as the Tripitaka Dharma Master, was a legendary Buddhist monk.Bodhidharma is traditionally held in Shaolin mythology to be the founder of the Chan school of Buddhism (known in Japan and the West as Zen), and the Shaolin school of Chinese martial arts. The major sources about Bodhidharma’s life conflict with regard to his origins, the chronology of his journey to China, his death, and other details.One proposed set of birth and death dates is c. 440–528 CE; another is c. 470–543 CE. The earliest historical record of Bodhidharma was compiled in 547 by Yang Xuanzhi, the Record of the Buddhist Monasteries of Luoyang, in which Yang identifies Bodhidharma as a Persian Central Asian (Wade-Giles: po-szu kuo hu-jen) (Broughton, 1999, p. 54, p.138). At that time there was a monk of the Western Region named Bodhidharma, a Persian Central Asian. He traveled from the wild borderlands to China. Seeing the golden disks reflecting in the sun, the rays of light illuminating the surface of the clouds, the jewel-bells on the stupa blowing in the wind, the echoes reverberating beyond the heavens, Bodhidharma sang its praises. He exclaimed: «Truly this is the work of spirits.» He said: «I am 150 years old, and I have passed through numerous countries. There is virtually no country I have not visited. But even in India there is nothing comparable to the pure beauty of this monastery. Even the distant Buddha realms lack this.» He chanted homage and placed his palms together in salutation for days on end. Yongning was built in 516 and destroyed in 526, dating Bodhidharma’s exultation to these years. Bodhidharma’s disciple Tanlin identifies his master as South Indian (Broughton, 1999, p. 8). The Dharma Master was a South Indian of the Western Region. He was the third son of a great Indian King..His ambition lay in the Mahayana path, and so he put aside his white layman’s robe for the black robe of a monk..Lamenting the decline of the true teaching in the outlands, he subsequently crossed distant mountains and seas, traveling about propagating the teaching in Han and Wei. The Biography is part of the Long Scroll of the Treatise on the Two Entrances and Four Practices, which Daisetz Teitaro Suzuki found in 1935 by going through the Dunhuang collection of the Chinese National Library. Daoxuan writes that Bodhidharma’s father is Brahmin. However, as a king, he is more likely to have been from the Kshatriya caste (Varma). Daoxuan takes his figure for Bodhidharma’s age from the Record of the Buddhist Monasteries of Luoyang. Tanlin’s original says «several» years. Daoxuan gives a figure of «four or five». Tanlin’s original says only that Bodhidharma «crossed distant mountains and seas» on the way to his ultimate destination, the northern Chinese kingdom of Wei. In Daoxuan’s account, Bodhidharma travels to by sea to southern China and then makes his way north, eventually crossing the Yangtze River, according to legend, on a reed. Daoxuan says that Bodhidharma makes landfall in the southern Chinese kingdom of Song, making his arrival in China no later than that kingdom’s fall to Qi in 479. Bodhidharma dies at Luo River Beach. His interment by Huike on a bank of the river, possibly in a cave, is unusual because masters of Bodhidharma’s reputation typically receive elaborate funerals. According to Daoxuan’s chronology, Bodhidharma must have died before 534, when the Northern Wei falls, because Huike leaves Luoyang for Ye at that point. The use of the Luo River Beach as an execution grounds suggests that Bodhidharma may have died in the mass executions at Heyin in 528. A report in Taishou shinshuu daizoukyou states that a Buddhist monk was among the victims. Bodhidharma makes landfall not during the Song period of southern China but in 527 during the Liang Dynasty. According to the Anthology, Bodhidharma’s voyage from India to China took three years. Before crossing the Yangtze River en route to Wei, Bodhidharma visits the Liang court in present-day Nanjing, but leaves soon after his uncompromising doctrines end up offending Emperor Wu. Bodhidharma dies at the age of 150 and is buried on Mount Xiong’er to the west of Luoyang. Three years later in the Pamir Mountains, Songyun, an envoy of one of the later Wei kingdoms, encounters Bodhidharma, who is on his way back West. Bodhidharma, carrying a single sandal, predicts that Songyun’s ruler has died, which is borne out upon Songyun’s return. Bodhidharma’s tomb is opened and only a single sandal is found inside. The nine years of meditation after his departure from the Liang court in 527 mean that Bodhidharma’s death can take place no earlier than 536, but his encounter with the Wei diplomat mean that his death can take place no later than 554, three years before the fall of the last Wei kingdom. Tradition holds that Bodhidharma’s chosen sutra was the Lankavatara Sutra, a development of the Yogacara or «Mind-only» school of Buddhism established by the Gandharan half-brothers Asanga and Vasubandhu. He is described as a «master of the Lankavatara Sutra», and an early history of Zen in China is titled «Record of the Masters and Disciples of the Lankavatara Sutra» (Chin. Leng-ch’ieh shih-tzu chi). It is also sometimes said that Bodhidharma himself was the one who brought the Lankavatara to Chinese Buddhism. Bodhidharma’s approach tended to reject devotional rituals, doctrinal debates and verbal formalizations, in favour of an intuitive grasp of the «Buddha mind» within everyone, through meditation. In contrast with other Buddhist schools such as Pure Land, Bodhidarma emphasized personal enlightenment, rather than the promise of heaven. Bodhidharma also considered spiritual, intellectual and physical excellence as an indivisible whole necessary for enlightenment.Bodhidharma’s mind-and-body approach to enlightenment ultimately proved highly attractive to the Samurai class in Japan, who made Zen their way of life, following their encounter with the martial-arts-oriented Zen Rinzai School introduced to Japan by Eisai in the 12th century. While early legends associate Bodhidharma with Mt. Song, where the Shaolin temple is located, it is not until the 11th century that we see the appearance of a hagiographical record (in the «Jingde Record of the Transmission of the Lamp,» Jingde chuandeng lu) explicitly associating Bodhidharma with the Shaolin temple. No mention of Bodhidharma is found in any of the many stele inscriptions preserved at the Shaolin temple from the Tang dynasty. 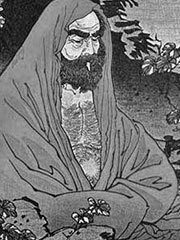 Legend also associates Bodhidharma with the use of tea to maintain wakefulness in meditation (the origin of Chado), and favoured paradoxes, conundrums and provocation as a way to break intellectual rigidity (a method which led to the development of koan). Throughout Buddhist art, Bodhidharma is depicted as a rather ill-tempered, profusely bearded and wide-eyed barbarian. He is described as «The Blue-Eyed Barbarian» in Chinese texts. Chan texts also present Bodhidharma as the 28th Chan Patriarch, in an uninterrupted line starting with the Buddha, through direct and non-verbal transmission. According to tradition, around 520, during the period of the Southern Dynasties, Bodhidharma was invited to an audience with Emperor Wudi of the Liang Dynasty. «Vast emptiness, nothing sacred,» was the bewildering reply. «I have no idea,» Bodhidharma replied. With this, Bodhidharma was banished from the Court, and is said to have sat in meditation for the next nine years «listening to the ants scream». Bodhidharma traveled to northern China, to the recently constructed Shaolin Monastery, where the monks refused him admission.Bodhidharma sat meditating facing a wall for the next 9 years, boring holes into it with his stare.Having earned the monks’ respect, Bodhidharma was finally permitted to enter the monastery.There, he found the monks so out of shape from lives spent hunched over scrolls that he introduced a regimen of exercises which later became the foundation of Shaolin kung fu, from which many schools of Chinese martial art claim descent. Historically, it is unlikely that Bodhidharma invented kung fu.There are martial arts manuals that date back to at least the Han Dynasty (202 BCE–220 CE), predating both Bodhidharma and the Shaolin Temple.The codification of the martial arts by monks most likely began with military personnel who retired to monasteries or sought sanctuary there.Within the refuge of the monastery, unlike on an unforgiving battlefield, such individuals could, confident in their safety, exchange expertise and perfect their techniques. Japanese legends credit Bodhidharma with bringing tea to China. Supposedly, he cut off his eyelids while meditating, to keep from falling asleep. Tea bushes sprung from the spot where his eyelids hit the ground. It is said that this is the reason for tea being so important for meditation and why it helps the meditator to not fall asleep.This legend is unlikely as tea use in China predates Chan Buddhism in China.According to Chinese mythology, in 2737 BC the Chinese Emperor, Shennong, scholar and herbalist, was sitting beneath a tree while his servant boiled drinking water.A leaf from the tree dropped into the water and Shennong decided to try the brew.The tree was a wild tea tree.There is an early mention of tea being prepared by servants in a Chinese text of 50 B.C. The first detailed description of tea-drinking is found in an ancient Chinese dictionary, noted by Kuo P’o in A.D. 350. It is also reported that after years of meditation, Bodhidharma lost the usage of his legs. This legend is still alive in Japan, where legless Daruma dolls represent Bodhidharma, and are used to make wishes. Bodhidharma was the first Zen patriarch of China.All later Chinese and Japanese Zen masters trace their master-disciple lineage to him.Huike, who was to become the second patriach, was first ignored when he tried to approach him, and left outside in the snow, until he cut his own arm and offered it to the Master. (This is supposedly the origin of the famous ‘one hand salute’ of the monks who came after him).Bodhidharma later transmitted to him the insignia of the patriarchs: the robe, the Buddha’s begging bowl, and a copy of the Lankavatara Sutra. The legend of Huike’s self-dismemberment is likely apocryphal. According to Daoxuan, wandering bandits cut off Huike’s arm. Although Bodhidharma is commonly said to have had two primary disciples (the monks Daoyu and Huike), a common voice in the «Records» of the Long Scroll is that of a Yuan, possibly identified with the nun Dharani who was said to have received Bodhidharma’s flesh — his bones having been received by Daoyu, and his marrow received by Huike.A list of Bodhidharma’s early students follows.